Make the most of your day by arriving early and staying longer so that you can enjoy our wide range of delicious food options during the HSBC london 7s. If you fancy something a little on the lighter side without scrimping on flavour then head over to Chicken Street. The Piri Piri and Jerk Chicken are sure to put a spring in your step! Our favourite - the Grilled Halloumi Wrap served with the signature homemade slaw and sweet chilli sauce. Don't worry fish lovers, we've got you covered. Who would have thought you can feast on wild Alaskan salmon while watching the game. Leap have stepped up the salmon game with their burgers and salads. For an Asian twist, try the Seoul Burger - kimchi, pickled cucumber, black pepper mayo and lettuce alongside a mouth-watering salmon fillet. For the health-conscious, a chickpea or slaw salad will not disappoint. Using meat sourced from the Queens butcher, it's no wonder Flying Cows won 'Britain's Best Burger' in 2017. Give 'The High Flyer' a go - aged Dexter beef, crispy bacon, American cheese and club sauce - and you be the judge. We can recommend 'The Beefy Blue' - aged Dexter beef, blue stilton cheese, sliced chorizo, homemade chorizo jam, lettuce, tomato and garlic mayo. Blue cheese + a perfect beef patty = a match made in heaven! With a range of fillings, you can't go wrong. Head to the West Fan Village to try the Pulled Beef Brisket Chilli Burrito stuffed with all the trimmings - herbed rice, guacamole, grated cheese and jalapenos. The Three Bean Chilli option will satisfy the meat eaters as well as vegans - give it a try and you won't be disappointed! Providing a Western take on a variety of Asian street eats, you can grab yourself a bowl of warming noodles, or a mouth-wateringly delicious burger. We recommend the breaded chicken burger in a toasted brioche bun, stuffed with notso mayo, cheese, salad, Asian slaw and tonkatsu sauce. Yum! The Green Grill aims to provide event-goers with great tasting, healthy vegan 'junk food'. Nothing is deep-friend and their distinctive burger buns are coloured with only 100% natural ingredients. We're looking forward to grabbing a 'Green Monster' burger - a matcha bun filled with sundried tomatoes, peas, broccoli, spinach, red bell peppers and garlic mayo sauce! It looks (almost) too good to eat! been handed down over the generations. 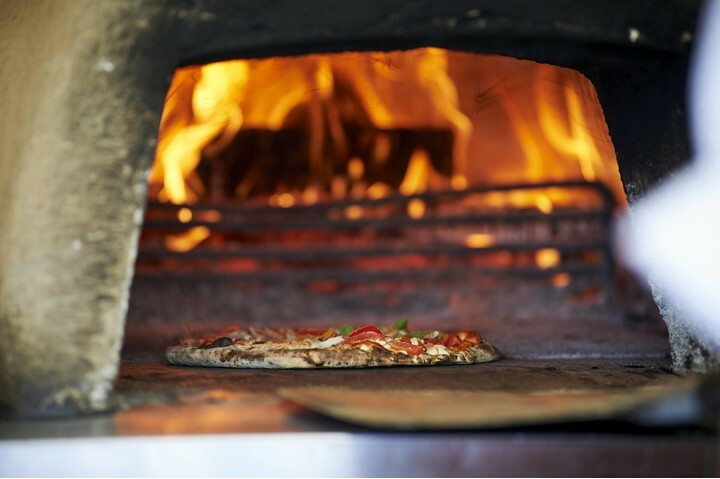 It's hand-stretched, topped and cooked in a wood-fired pizza oven. The Toast Office are experts in the art of the mighty toastie, allowing you to choose from up to four fillings including cheese, chorizo, pesto and many more! They're fully customisable, and they even have a selection of vegetarian fillings for you to choose from. Choose from a delicious range of tacos, including pork, chicken and the vegan-friendly butternut squash. Plus customise your tacos with a mild or medium dressing, or - to really lift the roof - ask for Ted's Hot Sauce! To top it all off, grab a glass of Prosecco or Pimms. We can't think of a better way to enjoy the sunshine (fingers crossed)! With a wide selection of pasties being served from the UK's largest pasty operator, we're sure they'll be one that takes your fancy. Plus, if you're looking for a vegan meal option, we'd recommend the vegan-friendly 'Thai Green Vegetable Curry Pasty'. A real taste sensation, which offers an Asian-inspired twist on a traditional Cornish staple! Choose from a wide range of quality meals, including the 'Korean Kimchi burger meal', which serves a 100% beef 8oz burger with crunchy Korean-style pickled slaw and Greek-style yoghurt, and the 'Union15 Burger meal', which includes southern-fried chicken, hash browns and BBQ sauce within a sweet-frosted doughnut! - Please ask your server for any of the above dishes. - All of the items are prepared with gluten-free ingredients. However, as the event environment is not 100% gluten-free, we cannot guarantee that any item will not have come in contact with gluten during preparation. Food and drink outlets within Twickenham Stadium will be completely cashless throughout all of the London Sevens.